Chef Martin Yan shows Ryan Scott how to perfectly peel and use fresh ginger. Martin Yan's tips to using and preparing ginger. 1. You can peel ginger with a little spoon dragging along the outside of the ginger towards you. Feel free to go around the entire ginger root so nothing is wasted. 2. If you smash a small piece of ginger with a cleaver you should be able to mince it faster. 3. You can also grate it along a microplane. 4. In Chinese cuisine, they like using minced ginger so you can taste the texture of it in your cooking. This simple but elegant dish inspired M.Y. China's "Wok Tossed Shrimp with Ginko Nuts." Any number of seasonal vegetables can be used in place of the snap peas. A delicious spin on the traditional Masala Chicken dish combining the flavors of both India and Italy. This sweet and savory marinated and roasted pork tenderloin is as versatile as it is delicious. While at Chef Martin Yan's house, Martin shows Ryan how to properly and effectively use chopsticks. 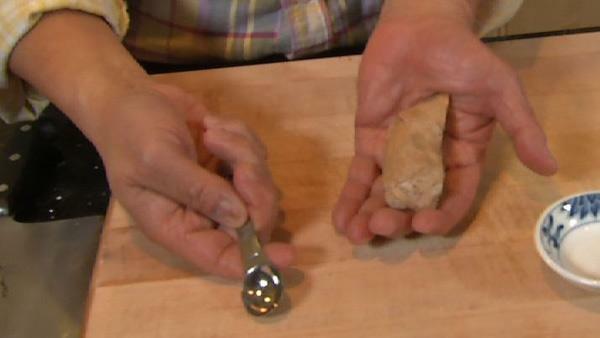 Chef Martin Yan shows Ryan Scott the benefits of cooking with sesame seeds and sesame oil.